In Lake Louise , you are just one hour away from the heli-ski base and the start of your ultimate lifetime experience. 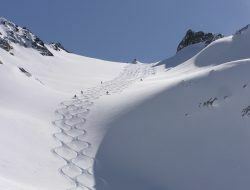 These heli-ski and heli-snowboard tours are for high intermediate to expert skier or snowboarders only. Lake Louise Heli-Snowshoeing tours are yet another alternate experience in the Canadian Rockies. Minimum numbers are required so get a group together to guarantee a departure. Helicopter cross-country skiing is also available. Contact us for details.